« Kenefick Goes to Vegas! For the past 20 years Creighton has had one of the most successful soccer programs in the nation by reaching the NCAA tournament 18 times including three College Cups and advancing to the National Championship match once, but with all this tradition another team on campus often is overshadowed in the fall: the women’s volleyball team. 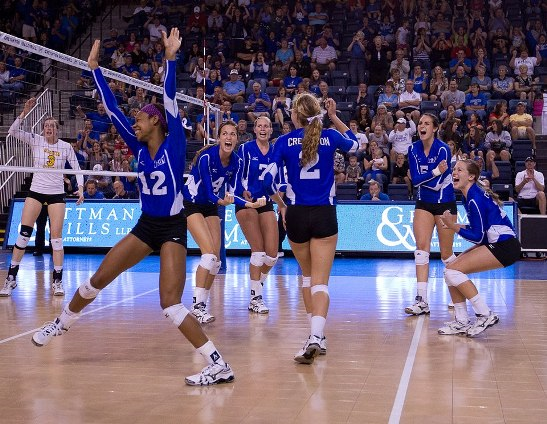 After a four-set victory over South Dakota on Tuesday the Creighton women’s volleyball team improved to 12-2 on the year with their only loses to Big 12 foes Kansas (ranked 28th) and Kansas State (ranked 15th). The women are off to the best start in school history and are ranked as high as 12th in RKPI (the volleyball equivalent of RPI for college basketball). These girls put their heart and soul into the program and the results are showing. Earlier this year Megan Bober was announced as a semi-finalist for the Lowe’s Senior Class Award, an honor that places takes into account both on and off the field actions. For the first couple of weeks the student section had a good turnout and it made Sokol Arena one of the most difficult places for opposing teams to win (see here), but lately the student section size has dwindled and more of the load has been put on the band and blue crew to make it a hostile environment. As a university we need to back our ladies up as they start the rigors of the Missouri Valley Conference schedule and embark on what could be unprecedented success for Creighton Volleyball. The next home weekend is Friday, October 5th at 7 pm against preseason favorite, Northern Iowa, followed by a battle with Bradley on October 6th at 5 pm. Hope to see you there and Roll Jays! *My name is Jordan Evans, I am an RA in Kenefick Hall and I support all of Creighton’s athletic teams.